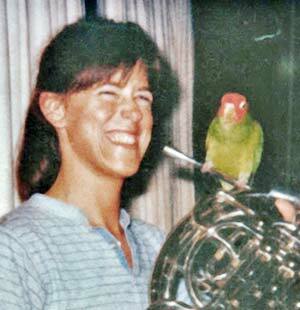 Heidi A. Vogel (born 1956) earned a BM degree from SUNY-Fredonia State College, after which, her career took many twists and turns that prepared her for work with the International Horn Society. Heidi’s first “real” job was selling mule rides at Grand Canyon National Park. She also taught K-12 Music at the National Park School, and worked and trained in the Fred Harvey accounting offices. She moved to Juneau, Alaska, to take a summer job at a river rafting company and stayed on as their bookkeeper. She then worked for the Alaska State Legislature in their Payroll and Personnel Office. After seven years, she took a part-time position with the Secretary of the Alaska State Senate and later became the Senate Secretary, which allowed her to take on part-time work as Executive Secretary with the IHS in 1997. Heidi has continued to play her horn in many community orchestras in Alaska, Hawaii, and now in New Mexico. She also served on the board and as President of the Juneau Symphony. Heidi has been the chief administrator of the IHS for the past 22 years. When she began, the job was primarily membership renewals mailed in by check, maintenance of the member database, and a few IHS programs. She has assisted seven society presidents and three editors of The Horn Call in maintaining and expanding the organization, as well as helping other staff and Advisory Councils develop, combine, and achieve their visions for the future of the Society. Under Heidi’s tenure, the Executive Secretary position increased in job duties and time to become a full-time position (re-titled Executive Director in 2015), involving the current variety of scholarship, composition, and commissioning assistance programs, several media outlets, an online system for membership recordkeeping and enrollment, board meeting preparation, contract drafts and reviews, promotion and design work, event assistance, bookkeeping, research, committee and project assistance, fundraising, non-profit compliance, and legal reviews and recommendations. Heidi has become a source of institutional knowledge for the last two decades of the International Horn Society, and is a proven excellent cat herder. The IHS Advisory Council recognizes her many selfless contributions to the society with the 2018 IHS Service Medal of Honor.